Zenith is the English name for Tatenokawa’s newest sake, a Junmai Daiginjo, made with Dewasansan rice, polished all the way down to 1%. That’s just 1% of the rice grain left after months of polishing. No-one has ever accomplished this before. 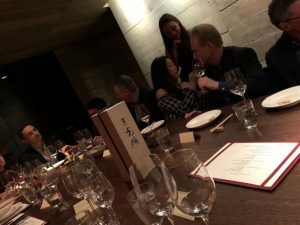 To celebrate, we invited Naomi-san from Tatenokawa to come over to the UK, teamed up with London’s ROKA Restaurant and, on 5th February 2018, held a dinner to be remembered. 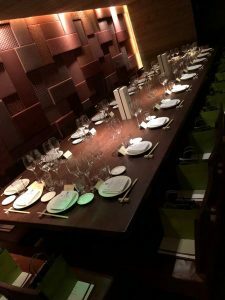 We decided to put on the most prestigious line-up of Tatenokawa sake available, allowing guests to compare different polishing ratios and different rices. 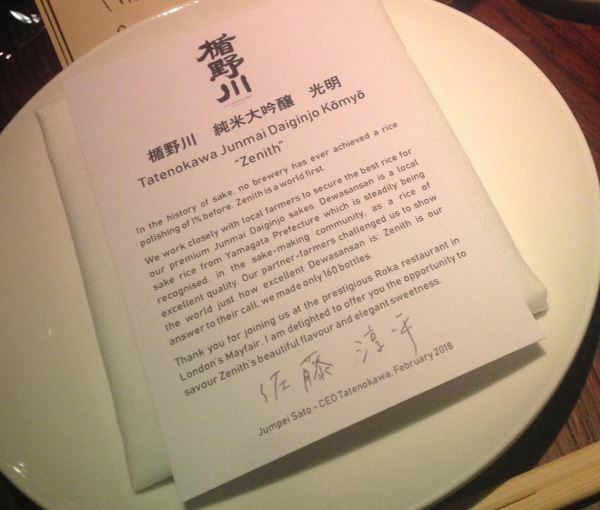 Tatenokawa only makes Junmai Daiginjo so each sake was – of course – polished 50% or more. Trying the 1% polished Zenith Dewasansan was an amazing experience. Only 160 bottles were made this year (winter of 2017) so be able to have one for the dinner was a true privilege. Naomi-san explained the challenges Takeshi-san, Tatenokawa’s Head Brewer, encountered and the reasoning behind the 1% (I will go into all this is another blog post – scroll through my blogs if you want to learn more about the 1%). We got to try the 1% side-by-side with the 8%: very interesting. Aside from the obvious difference in rice polishing ratios, the rice itself is also a differentiating factor. The 1% is made with Dewasansan and the 8% Yamadanishiki (in fact, it’s the highest polished Yamadanishki in the world). The 1% was ethereal, light and precise whereas the 8% had more weight and body, and more expression straight from the bottle. You would, of course, expect this and while it is a function of the difference in polishing, the choice of rice also has a part to play. No-where can this be seen more than when comparing the 33% and the 18%; 33% is made with Dewasansan and 18% with Yamadanishiki. Expectations would suggest that, while progressing from 33% to 18%, body and flavour would diminish; however, this is not the case. The use of Yamadanishiki for 18% subverts this expectation and results in a richer, denser brew. We decided to try and play off of this comparison by putting the richer foods with the 33% and vice versa for 18%. Some might think this a bit of a gamble but, of course, for a dinner of this quality we had tried all these combos before! 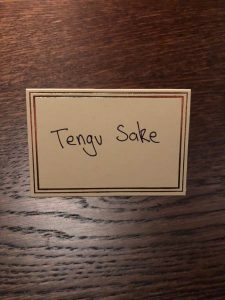 It paired perfectly, we chose fattier fish for the sashimi to balance the weight of the 18% sake, and teased out the sweetness of the Dewsansan rice with our food choices for the 33%. 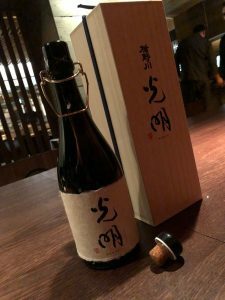 Joryu is a great sake – not one I normally import, maybe I should! – with excellent balance between body, acidity and aroma. Pairing this sake with the richest and heaviest flavours on the menu was a no-brainer. 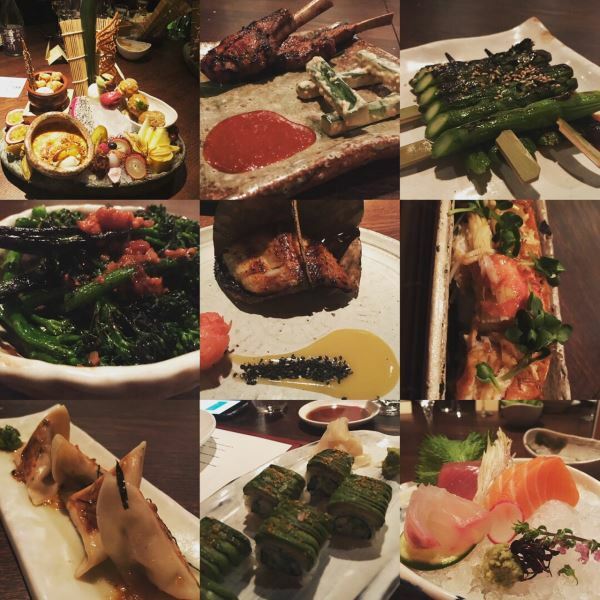 As the end of the evening rolled around we rolled out of ROKA, sated, fattened and with a distinct feeling that we had just experienced something special. A big thank you to the 25 people who attended the event.